Bryncarnedd Cottages Self-cateringBryncarnedd Country Cottages in Mid Wales are located 1 mile from Aberystwyth’s town center. Nestled in the immediate countryside at the top of Aberystwyth, these cottages enjoy the closeness to the town as well as being just far enough outside to enjoy a truly rural feeling during your holiday. On site we have 13 properties (3* and 4* graded) and 6 lodges for hire all year around, as well as a BBQ area for all of our guests to enjoy and an outdoor hot tub which is free of charge to use (availability is weather permitting). Bryncarnedd was once a busy dairy farm, providing milk for Aberystwyth and the surrounding area. Since its demise, the farmhouse and its surrounding buildings have been sympathetically converted into self catering holiday cottages. The 10 cottages, named after traditional farm buildings, vary in size sleeping from 2 to 10 persons, with 1 to 4 bedrooms – and each one uniquely decorated and furnished with luxurious fittings to provide the perfect accommodation for your holiday away. Most of the cottages have en-suite bedrooms, some of the cottages have patios and gardens, while others have Jacuzzi baths to relax and enjoy. All of the cottages have an open plan layout, enabling you to cook, eat and live in a bright and airy environment, making the most of you valuable time together. We have also two houses just outside of the converted farm buildings, a 3 bedroom property called Cambrian View, and a 4 bedroom property called Brynhyfryd, both built to very high specifications and enjoying amazing views over the surrounding countryside. All of our cottages in Mid Wales come equipped with a fully functional kitchen to include a fridge freezer, electric cooker and microwave. Some of our properties have dishwashers, and there are also some with washing machines. There is underfloor central heating for the colder months, along with Freeview TV, a DVD player and a CD player. We also offer free Wi-Fi to our cottages, however this does not extend as far as the lodges. Onsite there is a launderette at an additional charge, as well as a children’s play area. We are more than happy to accept pets at an additional cost – there are plenty of countryside and walks about the area for dog walking and exercise. We can provide high chairs and travel cots on request. We have a few cottages in Mid Wales which are disabled friendly, such as Brynhyfryd, Cambrian View, the Barn & the Workshop, all suitable for wheelchair users and properties such as the Dairy, the Calf Suite and the Milking Parlour suitable for those with limited mobility. All rates are inclusive of electricity and fresh linen – we provide towels and teatowels for your stay with us. Two communal hot tubs on site Children welcome from any age. Bryncarnedd Cottages offers weekly bookings starting on any day and sometimes short breaks. The Dairy is one of our ground floor properties, with no steps allowing ease of access for guests and is also one of our wheelchair friendly holiday cottages. This gorgeous bungalow has an enclosed garden and patio area to the rear, as well as a large conservatory overlooking the garden with views of the countryside. Inside, the bungalow is open plan in layout with a galley style kitchen, reception dining area and lounge in the conservatory. This property has been assessed by Disabled Holiday Info for our disabled guests and is suitable as a wheelchair friendly holiday cottage. This property is able to sleep up to 8 people in total (additional beds possible on request), and is one of our largest properties located at Bryncarnedd Country Cottages. With three bedrooms, this property is perfect for groups of friends or larger families. 01 The Dairy offers weekly bookings starting on Saturday and sometimes short breaks. The Calf Suite is a 2 bedroom self catering cottage in Aberystwyth, and can sleep up to 5 people in total. Located next door to the Dairy, this bungalow also has its own enclosed garden and patio area, with views across to the countryside. As with the Dairy all sleeping and living areas are on the ground floor, creating ease of access for our guests. The layout inside is open plan with a kitchen, dining room and lounge. Bedroom 2: A family bedroom with a double bed and single bed, with a bathroom en-suite. 02 Calf Suite offers weekly bookings starting on Saturday and sometimes short breaks. The Milking Parlour is a pet friendly holiday home in Aberystwyth at Bryncarnedd Country Cottages, and is located next door the Calf Suite. It is another one of our 2 bedroom properties, perfect for a family holiday. 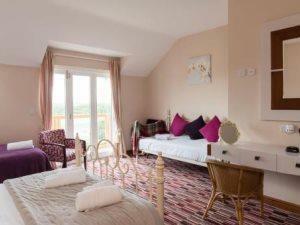 As with the Calf Suite this property can also sleep up to 5 people, and has its own garden and patio area to the back. Both bedrooms are ensuite, and the property also has a kitchen, lounge and dining room. All living spaces are on the ground floor, perfect for those who are hampered by stairs. Bedroom 1: A double bedroom with a shower en-suite. We can add an extra bed if required. Bedroom 2: A family bedroom with a double bed and single bed, and a shower ensuite. 03MilkingParlou offers weekly bookings starting on Saturday and sometimes short breaks. The Hay Suite is a luxury holiday cottage with Jacuzzi, and our only 1 bedroom property at Bryncarnedd Country Cottages and is perfect for a romantic getaway or relaxing break away with your other half. Awarded its stars in recognition for the high quality furniture and fittings, this cottage has an open plan layout on the ground floor with a kitchen, lounge and dining area and a deluxe double bedroom upstairs with a Jacuzzi bath en-suite. We can add an extra single into the double bedroom if required. 04 Hay Suite offers weekly bookings starting on Saturday and sometimes short breaks. Follow the A487 until you see the signpost for BOW STREET - continue forward onto the A487 when entering into Bow Street and follow towards Aberystwyth. When entering Aberystwyth, which is 2.4 miles from Bow Street, turn right onto the B4572 (sign posted Clarach/Borth). This turning is directly at the top of the hill before you descend down to Aberystwyth. If you are descending and see the University on your left, you have gone too far! Once on the B4572 you will come to a bend in the road approximately 0.4 miles from when you turned, and take the left signposted ‘Bryncarnedd Caravan Park & Cottages’ and bear to the right and follow the country lane to the cottages. Continue forward on the A44 from Llangurig, driving through Capel Bangor. At the Lovesgrove roundabout, take the 2nd exit up onto the A4159. This road takes you through Capel Dewi. You will stay in the A4159 for 1.5 miles, at which point you will turn left off this road and onto the A487. If you cannot see this left hand turn, do not worry as the A4159 carries on directly to Bow Street, where you can then turn left when you hit the A487 and follow the instructions as above. From the south you will enter Aberystwyth by passing through Rhydyfelin. This road takes you to a roundabout, where you will need to take the 1st exit onto the A487 – this is sign posted for Penparcau. Carrying on along this road you will descend into Trefechan and then across a bridge (with the Rummers Wine Bar to your left) and into Aberystwyth. Continue to follow the A487 up the High Street, until you come to the top of town. At the top of town you will see a town clock; here you will need to turn right, taking you down Great Darkgate street. This is a one way system which will lead you to the University and the National Library. As you carry on along this road, you must keep to the MIDDLE lane. The left hand land will take you to the promenade and the right hand lane directs you back into town. The middle lane will follow onto a set of traffic lights next to a small Spar shop – follow this road. You will start to ascend Penglais hill, where you will pass first Bronglais Hospital, the National Library and then the University. At the top of this hill there is a cross roads, where you will need to take the left turn towards Clarach/Borth.